I love Christmas, it's my favourite time of the year where I can eat as much as I like and enjoy the company of family and friends. 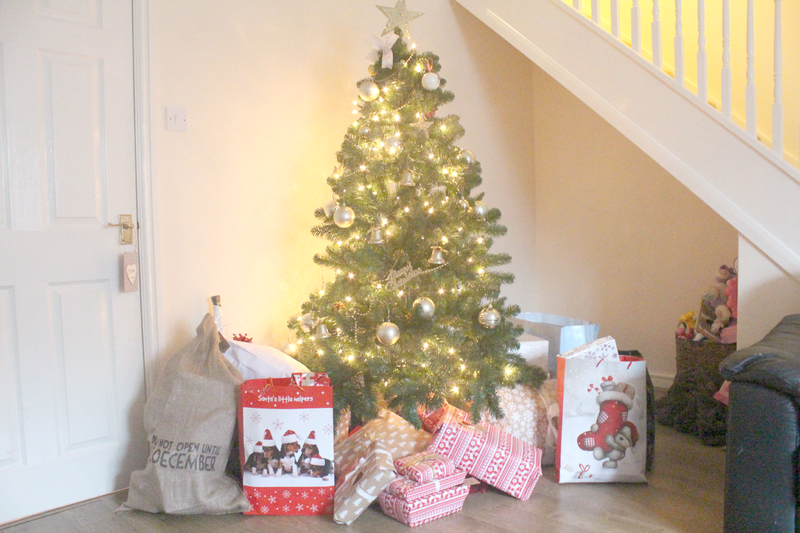 I am really excited for Christmas this year as it will be Harry's first! I've never been one to find Christmas stressful as I always plan ahead and have never had a large family to cook for as it's always only been ourselves. However many people find Christmas and the running up to it a stressful time of the year. 1. Start shopping in the January sales or even better the boxing day sales. You don't even have to leave the house! I have many friends who shop around this time and manage to have all the shopping done by the end of summer which means they don't have to worry about being broke around Christmas. 2. Start saving at the beginning of the year, there are so many ways that you can save from transferring money from your pay check to a bank account each month, using a savings tin or even a 52 week money saving challenge. I will be sharing my printable with you all which I made last year on the blog soon. 3. If you have a big budget or one which you plan to stick to why not make your own decorations instead? Get the kids involved and make some which can then become a yearly tradition. There are many tutorials on Pinterest for making your own tree decorations including baubles! This video below by TSB shares some quick and easy gifts that the kids can make either for a teacher or grandparent. 4. Make the most out of your Christmas dinner and make various meals out of the left overs to eat in the following days or even to freeze and have at a later date. I always remember when I lived at my parents having turkey curry and various other turkey based meals. Check out Pinterest for lots of recipe ideas. 5. If you have children stock up on batteries before the big day! There's nothing worse than having lots of new toys to play with but no batteries! Don't make the same mistake I did. You could even set the toys up with batteries before wrapping to avoid time and tantrums on the big day. 6. Check to see if the shop can keep your presents until a couple of days before Christmas especially if they're large presents which you can't easily hide at home. We used the buy and store service at Halfords for Amelia's bike as I had no where to keep it and I can collect it tomorrow and hide it in the car to bring in once she's in bed on Christmas Eve. 7. If you despise gift wrapping as much as I do find somewhere which will wrap your presents whilst you eat! A restaurant local to us offers this fantastic service throughout December and all you need to do is bring along your presents and gift wrap and they'll do if for you whilst you enjoy your meal. I think this is a great service. I do like gift wrapping but I am pretty rubbish at is, so may take them up on this next year! 8. Stock up on wrapping paper and gift wrapping supplies in the sales after christmas. You can get some fantastic deals with wrapping paper being reduced down to as low as 10p or even luxurious wrapping paper from M&S and Paperchase seeing huge savings. You can then store all of this away in the attic or garage ready for next year. 9. If money is tight this Christmas how about buying your turkey from Lidl or Aldi and then popping in a couple of days before hand when the supermarkets start reducing their produce to stock up on veg and other bits and bobs. 10. Don't forget to keep your receipts just incase the gifts you buy are unwanted or the wrong size. Many stores these days do gift receipts so you can give them with your gift and they won't show the person how much the item cost. Those are my top 5 tips for a stress free Christmas. If you're looking for more tips this Christmas check out the TSB Christmas Tips Guide for more inspiration. What are your top tips for a stress free Christmas? * In collaboration with TSB. For details on how I work with brands take a look at my work with me page.